This chair always welcomes you with a nice embrace. And with perfect seating comfort. mylon follows the principles of classic chair construction, except with a contemporary design language, and it can be combined with a wide range of tables. The backrest appears to flow seamlessly from the raised rear legs, giving the chair a streamlined, minimalist appearance. Its elegant curves wrap around the body just like an embrace. With its ergonomically shaped seat surface made of 30 mm thick solid wood, it offers superior seating comfort that goes far beyond that of a regular wood chair. mylon also presents this comfort in the upholstered version, offering an elastic seat combined with high-quality, breathable fabric or leather covers. Perfectly coordinated, both versions can easily be combined into one table. This chair is ahead of the curve. The backrest of the mylon chair is made from a single piece of solid wood that, in production, is first curved and then set aside for three to four weeks to let the material ease into its final shape. Only after that process is complete does the backrest assume its definitive shape. The corners thus rounded off make the seating experience all the more comfortable. The base is also made of solid wood. 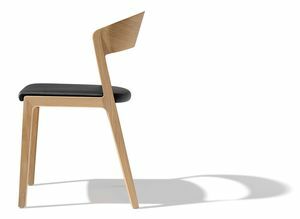 The rear legs’ upward slant lends a dynamic appearance to the mylon chair. At the same time, combined with the backrest that is tapered and pulled forward, they function as convenient armrests while sitting and rising. The gentle chamfer in the transition from the foot base and backrest is a true pleasure to handle.